The development of Gwader port by china in Pakistan is of international significance. Its geostrategic location may reshape the traditional maritime trade routes. The new oil trade route would financially and strategically benefit China and Pakistan. The other stake holders such as GCC and Iran would find opportunities and challenges both politically and financially as China and India compete for military/naval supremacy in Indian Ocean. This paper examine why Gwader port is important for all afore mentioned stakeholders, particularly for the major GCC oil produces and the ultimate giant energy consumer, China. The document also analyses the minimizing political and economic importance of Strait of Hormuz and Strait of Malacca in context of Gwadar emerging as new energy corridor for china, Pakistan. In today’s world economics and politics are two integrated faces of development for all developed, developing and underdeveloped nations. The degree of influence by nations, of nations and on nations may vary but isolation and development cannot go hand in hand. Apart from the technological advancements and transformation in means of transportation, sea routes have remained the focus of large scale transportation of industrial goods, heavy carriage items and general travelling. The modern concepts of peace and conflict have changed the meanings of sea waters. Maritime security, military deployment, submarine missions, ensuring and cutting supply lines have created irreversible and inevitable impact of sea ports, much more important than ever. It is important to note that out of top ten busiest ports seven are in Asia and out of those seven, two are in china and two are part of Chinese territories. In top ten ports UAE is at number seven, the only GCC port among the busiest ports of the world. No Indian, Iranian, Pakistan or Indian port is part among top 10 world busiest ports. The most important question is why Gwader port of Pakistan, being its early years of operation, with low volume of trading and small network is o important when it even does not fall within the category of large ports. The most appropriate way to find the correct answer is to analyze different geo-strategic, geopolitical and economic aspects of Gwadar. Gwader is a small town and an underdeveloped distract of Baluchistan province in Pakistan. Until 1958 Gwadar was part of Oman but was transferred to Pakistan on 8 September 1958. The Gwadar enclave sold to Pakistan (effective 8 December 1958). First time in 1964 it was thought to build a port at Gwadar and but being ignored for four decades. It was integrated within the Baluchistan on 1 July 1977. In 1992, Gwadar fish harbor reached its completion. The Gwadar deep sea port project started in June 2002 with the help of China. By the end of 2004 first phase of port had been completed. (Alamgir, 2011). Gwadar is located on the shores of the Arabian Sea in the western province of Balochistan. It is about 533 km from Karachi and 120 km from the Iranian border. Gwadar Port is located at the mouth of the Persian Gulf, just outside the Straits of Hormuz, near the key shipping routes in and out of the Persian Gulf (Authority). Keeping the trade and political ties intact with GCC, how Pakistan and China together can benefit from Gwadar port while? How Iran in context of oil trade with china is going to responds to Gwadar port while strengthening its Chahbahar port where India Iran’s technical and strategic partner? How Gwadar would create a new oil trade route through bypassing Strait of Hormuz and minimizing the Strait of Malacca’s role for China, Iran and GCC? The study is a desk research. Data is collected through scanning different web based and library sources including but not limited to websites, journals, repots, books, newspapers, and periodicals, research papers and articles. Standard procedure of data analysis is opted followed by the report writing. Gwadar port is owned by Gwadar Port authority, Government of Pakistan. In the phase one of construction government of Pakistan spent USD $248 Million. Gwadar port is into the phae-2 of its construction since 2007 and the estimated cost of construction is USD $932 million. The operational rights of Gwadar port in firs t instance were given to Port of Singapore Authority but later the agreement was transferred to Chinese state owned company, China Overseas Ports Holding Company Limited on Jan 30, 2013. Since then china has taken operational control of Gwadar port. The most immediate benefit is creation of jobs for locals of economically marginalized province of Baluchistan. Increase in foreign exchange reserves through transit fees and levies. Expansion in hotel and tourism industry. Gwader as corridor of energy security for Pakistan as Iran has shown readiness to establish a $4 billion oil refinery there. The IP gas pipeline too would have an enormous economic impact in the region. Pakistan and China must also develop a road-railways network from Port Qasim-Karachi along the west bank of the River Indus and take it right up to Torkham and beyond (Malik, 2013). China is planning to build a oil refinery at Gwadar as well. the pipeline from refinery will connect to Xingiang in china,. The potential oil pipeline would bring china and Pakistan many economic benefits. It would improve the overall economy of the country (Alamgir, 2011). Gwadar will serve as the safest and shortest route for Chinese oil supplies from gulf countries particularly from UAE and Oman. Militarily, Gwadar would be an asset for Pakistan and China as well. It would give Pakistan a strategic edge over India in case of armed conflict. . The lesson learned from 19365 and 971 wars with India Pakistan no more considers Karachi as a safe. Gulf oil has to go through 14,500 kilometers in to reach Xingjiang province in china through the traditional strait of Malacca route. First it takes 10,000 kilometers through sea and then 4500 kilometers by almost whole of the Chinese land. Gwadar is expected to curtail the total distance by almost 11,500 kilometers in total even is the distance between Oman and Gwader port is included. It would be only 2500 kilometers from Gwadar Pakistan to Xingjiang, China. It is not only cost effective but also safe and secure secure in comparison to the maritime route. Currently Chinese oil tankers on an average take 20 days in reaching the Gulf. However, after the completion of the high-speed rail and road networks across Pakistan, oil tankers from eastern China would reach Gwadar, right on the mouth of the Gulf, within 48 hours. China‘s 60 per cent energy requirements are met from the Persian Gulf. Gwadar reduces the distance by several thousand km even for eastern China once the oil pipeline from Gwadar to China materializes. So Gwadar provides China a land-based oil supply port that is controlled by an ally, Pakistan. China can also import Saudi Arabia‘s oil via Gwadar as reportedly Saudi Arabia had asked Islamabad in 2006 to help extend her oil exports to China. Gwadar also provides the opportunity to China to monitor and check its Sea Lanes of Communication. Though Gwadar is located in Pakistan, the geostrategic location makes it is an important place for Middle East particularly for GCC countries. The importance of Gwadar got manifold as china stepped in not only as Pakistan’s operational partner but also long term investor and military partner. It is obvious that china is surpassing USA in term of expanding global trade, energy diplomacy and political relations. In GCC region Saudi Arabia is largest oil producer and exporter. The Saudis see Chinese purchases of energy and energy cooperation with the Middle East Kingdom as an opportunity to diversify its markets and lessen its dependence on the U.S. And they are protecting their profits by investing in China’s oil refinery sector. So again we find that China’s rise weakens America’s influence by loosening the bilateral dominance that the US has over its allies (Zweig). Geographic proximity makes Gwadar much more important place for GCC counties. The distance between Gwadar port and Oman’s Muscat port is just 208 nautical miles or 385 kilometers. This can be a very short distance and undersea gas/oil pipeline a route for transportation through ships. The other main significant producers of Oil and gas in region are UAE, Qatar and Oman. The Gulf’s main gas exporters the UAE (around six million tons a year from Abu Dhabi) and Qatar (reaching seventy seven tons per year by the end of 2010 from its current capacity of around fifty million tons) channel their exports through the Strait in liquid form (liquefied natural gas – LNG). Currently, no pipelines exist in the Arabian Gulf to export gas outside the GCC – although the Dolphin Pipeline transports Qatari LNG to the UAE, also connecting across the border into Oman. States like the UAE and Qatar may be planning more seriously now for an overseas oil and gas terminal and could move forward on using facilities in Oman, look to the close-by Gwadar deep seaport in Pakistan – or both (Khan S. , 2010). Though in recent past there are certain examples of GCC favoring and prioritizing India over Pakistan due to several political, economic and trade reasons. The good example is context of Gwadar is of Dubai Ports World, is a UAE-based port management company. It has operations in more than nineteen terminals worldwide, twelve of these in Asia. Three more Asian projects (in South Korea, India, and Vietnam) are currently under development. In 2006, DPW expressed an interest in operating the Gwadar port in Pakistan, but it abandoned this plan because of objections from India. DPW currently operates two ports in India and employs 97,000 people worldwide (Habibi, 2008). With emergence of Gwadar as an important and busy port being china as its operator and GCC state would need to restructure their political and trade priorities. Particularly Pakistan can be used a trade gateway from GCC to china. The shorter distance from Gwadar to western china would not only be financially feasible but also a safe route in contemporary pirate threats. 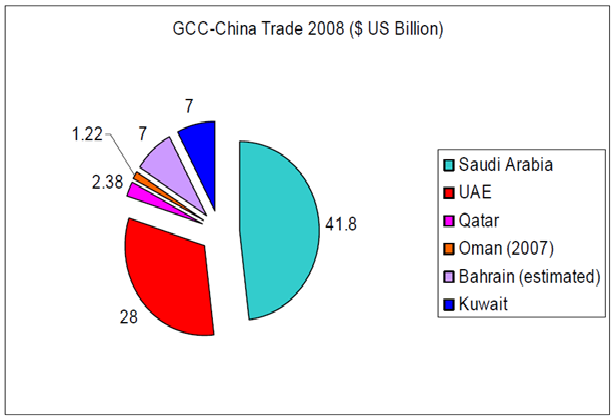 The time saved would also give both GCC and Chinese companies a competitive edge over others in global businesses. 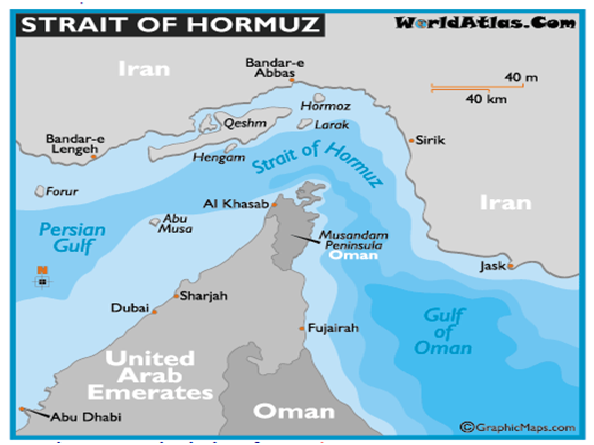 Every year, some 60% of the world’s oil is transported through the Strait of Hormuz (Burdman, 2001) Strait of Hormuz is located between Gulf of Oman and Persian Gulf. In terms of trade and militarily it is one of the most important checkpoints on earth because it is the only sea passage from Persian Gulf in to Indian Ocean. The geostrategic location makes it more important as Iran is on its north coast and UAE and Oman on its south coasts. Its narrow width of just 39 kilometers makes it militarily more important to Iran. The Arab monarchies saw Iranian Shiite Islamic revolution in 1979 as potential threat for their regimes. In context of Iran’s nuclear program the Iran’s relations with USA remain a major reason of rift between GCC and Iran as GCC countries are strong allies of USA. Iran has history of armed conflict with Iraq. The Iran-Iraq war lasted for eight years leaving Iran with thousand of dead and injured and financial damage in billions of dollars. Iran has territorial disputes with UAE on Tumb and parts of Abu Musa. It has strong business ties to the UAE, but the UAE also seeks to mitigate Iranian influence. Bahrain accuses Iran of supporting the Shi’ite majority and supporting demonstrations against the government of Bahrain, and Saudi Arabia views Iran as its largest security threat. Iran’s rivalry with the Gulf could conceivably escalate. If Iran develops nuclear weapons, Saudi Arabia could possibly seek nuclear capabilities (Sadika Hameed, 2014). The most important point is that in case of any conflict either with USA or with any of GCC states Iran and block Strait of Hormuz. As discussed earlier the world’s 60% oil supplies thorough Strait of Hormuz. The most immediate effect of closure of Strait of Hormuz would be on GCC oil and gas exporting countries and largest importers such as China, India and USA. Indian experts have already shown their concern on this issue; any conflict in the Gulf region in the past has had a negative impact on the supply and price of oil from the Gulf. Iran has time and again threatened to close the Strait of Hormuz in case of an attack on the country. A peaceful and stable Gulf region is in India’ interest and India needs to carefully nurture its policies in the region (Pradhan, 2011). This shows not only India’s concerns but also gives an idea that India is watchfully working on structural and long-term dimensions of its foreign policy. India is actively involved in building Chabahar port in Iran to have a competitive and strategic advantage over China. Only the time will tell how Iran responds in scenario of conflict. The other important factor is china’s relations with Iran. At the moment Chabahar port and Gwadar ports are seen as strategic competitors but in days to come the intervening factors may decide that how China and India safeguard their economic and military interests by investing and building ports in other countries. 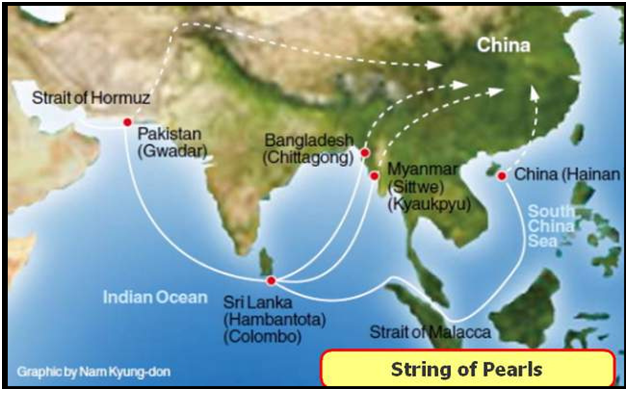 China’s string of pearls is a term uses for the ports in Indian Ocean china has invested in. Chinese state-owned corporations have financed commercial ports in Pakistan (Gwadar), Sri Lanka (Hambantota and Colombo), Bangladesh (Chittagong) and Myanmar (Sittwe and Kyaukpyu).China’s “pearls” emerge to be what Beijing declares they are: conventional shipping facilities designed to connect China’s landlocked western provinces to maritime trade routes in the Indian Ocean. It is important to emphasize that, Indian and US concerns regarding “string of pearls” remain largely in the realm of abstract assumptions. (IPRI). Among all these ports Gwadar remain the most important pearl for china. Gwadar has attracted international attention and long been labeled as a node in China’s ‘string of pearls’ strategy that would provide a number of maritime access points in the Indian Ocean which the Chinese navy should be able to use in case of crisis. However, the Chinese have dismissed such insinuations and argued that the Chinese investments in the project have no military dimensions. No doubt, Gwadar offers several economic opportunities and there are many strategic gains that China can accrue from the port to protect its interests in the Indian Ocean. It is fair to argue that China’s interests in Gwadar go beyond the safety of their energy related shipping from the Persian Gulf, but the facility could provide the Chinese a forward base to monitor the US naval activity in the Persian Gulf region as also Indian naval activity in the Arabian Sea (Sakhuja). Though china has large volume of trade with GCC countries, it is obvious that the increasing energy and global strategic needs compel China for work on alternatives and rely on diversified trading partners as well. China meets 80 % of its energy needs through imports. Keeping in view the Iran’s uncomfortable relations with GCC countries the strengthening trade and business ties of china with Iran are matter of concern for GCC countries and for USA as well. China has overtaken Germany as Iran’s third largest trading partner. Sinopec acquired a 50 percent share in Iran’s Yadavaran oilfield and in 2004, it concluded a deal estimated between $70-100 billion to buy Iranian crude oil and natural gas over 30 years. More recent deals have included a $1.76 billion deal to develop Iran’s North Azadegan oil field and a $3.2 billion gas deal signed in March 2009 to build a transport liquid gas line from the South Pars Gas Field (Sager, 2010). In context of Iran Pakistan gas pipeline and Chinese investment in Gwadar port GCC countries have both opportunities an threats. It is entirely up to the GCC how do they capitalize on opportunities and how threats are converted in to further opportunities. For instance Saudi Arabia and UAE envision meeting their future energy needs though renewable and nuclear energy particularly Saudi Arabia is determined to overcome the domestic energy shortage mostly through the combination of nuclear and solar energy. In this case GCC countries would produce more oil for export. For china to import the GCC oil Gwader would be the shortest and safest route. 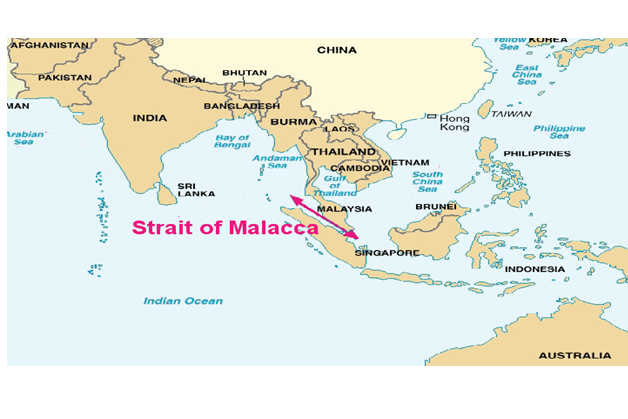 Strait of Malacca is located between Malay Peninsula and Indonesian island of Sumatra. It is the major oil trade route for china within the given conditions, by 2025 Strait of Malacca is expected to facilitate about 75 percent of China’s energy imports, which explains its plan to provide more than a billion dollars in aid and loan guarantees for building the Pakistani port of Gwadar. Beijing is keen to use Gwadar as a transit terminal for Iranian and African crude oil imports, which leaves open the possibility of a role for Chinese naval patrol. 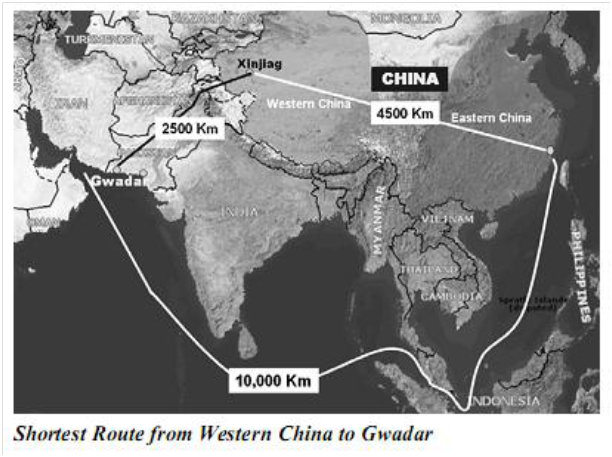 A road, and eventually a pipeline, from Gwadar could give China the alternative energy route that it urgently needs and spur the development of its western provinces (Sager, 2010). Gwadar would provide Caspian, Central Asian, and West Chinese exporters with an increased route to market, overtaking ports in the Gulf. It could similarly provide an alternative transit route to East and West Asian consumers if the Strait of Malacca chokepoint ever became constricted. Indeed, the so-called ‘Malacca dilemma’ has concerned. The political implications of Chinese reach into Pakistan are particularly significant for India, whose growth both countries are keen constrain (China because of economic competition, and Pakistan because of political rivalry). This is all part of a broader commercial/military approach by Beijing known as the ‘string of pearls’ strategy which seeks to create sea lines of communications which encircle India and establish Chinese dominance across the Arabian Sea, Indian Ocean, and Bay of Bengal (Maher, 2013). The energy security is major concern of china and Strait of Malacca has a potential risk of blockade by USA. In this case Gwadar would remain an open corridor to meet china’s energy need through Iran’s and GCC countries oil. From a military standpoint, Gwadar already offers a valuable mechanism for monitoring commercial and military traffic through the significant chokepoint at Hormuz. Over the longer tenure, should China widen a navy strong enough to project probable power into the Indian Ocean, then the port promises to allow Beijing – for the first time – to directly shape events in the Persian Gulf (IPRI). Gwadar port has become more important after china taking charge of its operations. To ensure the uninterrupted energy supply line it is in absolute interest of china not to abandon Gwadar project. Gwadar would serve as shortest and fastest oil supply route not only for china but also for Iran and GCC. Though Gwadar has certain challenges for GCC trade it bypasses Strait of Hormuz for GCC oil exporters. In case of blockade of both Strait of Hormuz and Strait of Malacca GCC countries and Iran both can continue interrupted supply of oil and gas to china, Pakistan and India through Gwadar port. A balanced foreign policies of GCC countries and Iran can shape the new maritime route for oil export to china avoiding threats of piracy posed to logistics through Strait of Malacca. Gwadar carries a lot of promise for almost all the stakeholders, GCC states should see Gwadar as potential opportunity but not as a threat. China should be more focusing on building supporting infrastructure within Pakistan. This may include new railways tracks, highways and possible a pipeline connecting Gwadar and China. With emergence of Gwadar a chin’s important pearl the Iranian strategic move to bloc Hormuz would not get the desired results. Iran should consider using Gwadar for its oil exports to China. GCC countries particularly Oman should take advantage to being nearest port to Gwadar and should take practical steps in making policy reforms that could encourage other GCC states to enhance their volume of trade with china through Gwadar port. Fazl-e-Haider, S. (2012, 10 07). A great game begins as China takes control of Gwadar port. The National (http://www.thenational.ae) . Habibi, N. (2008, June). Managing the Oil Wealth. Crown Center for Middle East Studies, Brandeis University. IPRI. China’s String of Pearls: An Analysis. IPRI. Khan, S. A. (2013). Geo-Economic Imperatives of Gwadar Sea Port and Kashgar Economic Zone for Pakistan and China. Islamabad Policy Research Institute Journal , 87-100. Khan, S. (2010). Iranian Mining of the Strait of Hormuz –Plausibility and Key Considerations. Institute of Near East and Gulf Military Analysis (INEGMA). Maher, S. (2013). The Arab Spring and its Impact on Supply and Production in Golbal Markets. London: European Centre for Energy and Resource Security (EUCERS). Malik, I. (2013, 02 24). Gwadar - a port full of possibilities. The Nation (Newpapaer) . Partnership-Pakistan, S. A. (2009). Profile of district Gwadar with focus on livelihood related issues. Lahore: South Asia Partnership-Pakistan. Pradhan, P. K. (2011). GCC-Iran Rivalry and Strategic Challenges for India in the Gulf. Indian Foreign Affairs Journal . Sadika Hameed, J. H. (2014). 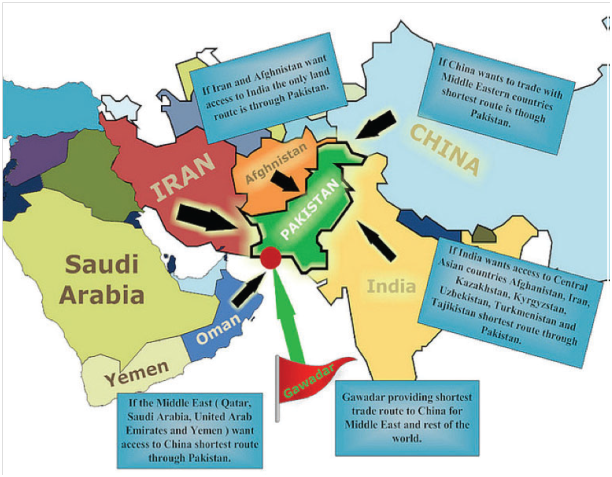 Regional Dynamics and Strategic Concerns in South Asia: Iran’s Role. Washington: Center for Strategic and International Studies (CSIS). Sager, A. (2010). GCC-China Relations: Looking Beyond Oil – Risks and Rewards. China’s Growing Role In the Middle East:Implications for the Region and Beyond . Sakhuja, V. Pipelines, Ports and Politics: The Gulf Region, Central Asia and India. Indian Council of World Affairs. Zweig, D. (n.d.). “Resource Diplomacy” Under Hegemony:The Sources of Sino-American Competition in the 21st Century? Working Paper No. 18 . Hong Kong: Center on China’s Transnational Relations,The Hong Kong University of Science and Technology. ICSANA - Copyright © 2014. All Rights Reserved.